I love this sign for its sense of mischief. It’s suggestive without crossing the line into vulgarity. The playful store name becomes a kind of makeshift clothing for the two models. 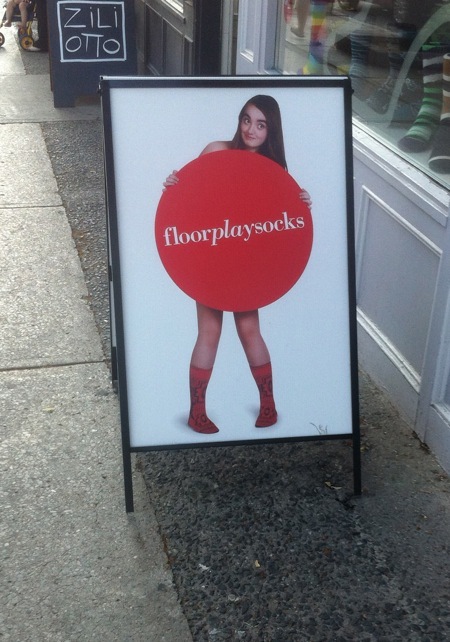 The product—socks—takes centre stage, while it’s left unclear whether these two are wearing anything else. What do you think? Is this sign going too far to attract attention? This entry was posted on September 15, 2013 at 4:46 pm and is filed under Uncategorized. You can follow any responses to this entry through the RSS 2.0 feed. You can leave a response, or trackback from your own site. I walk by this very cool place often (live in the neighbourhood) and have gone in the store. I like the signs and marketing, it’s not offensive, the models on the signs are cheeky and fun (not sleazy). I read a comment on-line from someone saying they didn’t like it because it suggests the models are only wearing socks. What the heck is wrong with that? For goodness sake, Toronto shed its Victorian attitudes 15 years ago! This is just playful innocent fun, IMO. Thank you for your comment. I agree with your opinion that the sign is just playful innocent fun. I’m curious if anyone out there disagrees. Readers, please feel free to add your opinions to this discussion.